I am involved in an art class online entitled art, heart and healing. This is the first product of that class. I am pleased with this. That being said, quick background, I haven't drawn for about 40 years. I won't stop now. I have so many ideas than projects planned now. I hope you don't mind my sharing them. 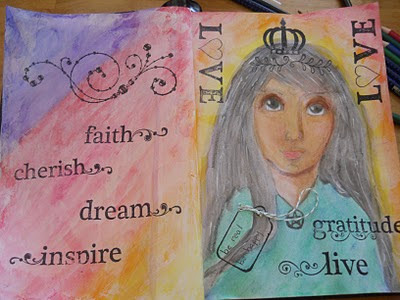 Linda - your journal page is wonderful! I love it. I am also participating, although I haven't finished my page yet - those layers!!! Tam is an incredible teacher, isn't she? I think this is wonderful, good for you. I was going to do this one, then because I am doing another online I decided I did not have enough time. please show us. I think your doing awesome. Oh what a wonderful activity! Your artwork is gorgeous! I want to look into this...just gorgeous! I like your painting. And your Halloween photos are awesome! I really love the creative green aloe fingers - I hope I remember that next year. I have my Halloween party on my blog with photos. My FIL lives in Santa Fe and we get there a lot - loved it!